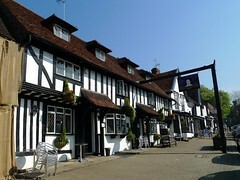 Pub in Pinner, housed in a Grade II listed building dating back to the 16th century. There's no music or TV, and the interior retains a rustic charm, with low ceilings and sturdy wooden furniture. There's a large patio area out the back, with some cover from the elements. There are 7 handpulls along the bar (which is split into three sections by some panels, as well as by steps in the middle of the room). Regulars are Abbot Ale, Adnam's Bitter, Young's Special and Bombardier. The chalkboard behind the bar lists two guests (and one outside advertises those coming soon), which on Ewan's April 2011 visit were Greene King London Glory and Bath Ales Spa. There's a short wine list, with large 250ml glasses at around £5. According to the Queen's Head website as of September 2010, food is served noon-2pm every day, and quiz night is Monday from 7:30pm. Ewan tried the battered cod and chips (£7.70), which was a substantial portion and filling; I was given an option for either garden or mushy peas. Last visited by Ewan and Kerry, 22 April 2011. Opening hours taken from the 2011 Good Beer Guide. Last edited 2013-09-12 23:30:42 (version 8; diff). List all versions. Page last edited 2013-09-12 23:30:42 (version 8).